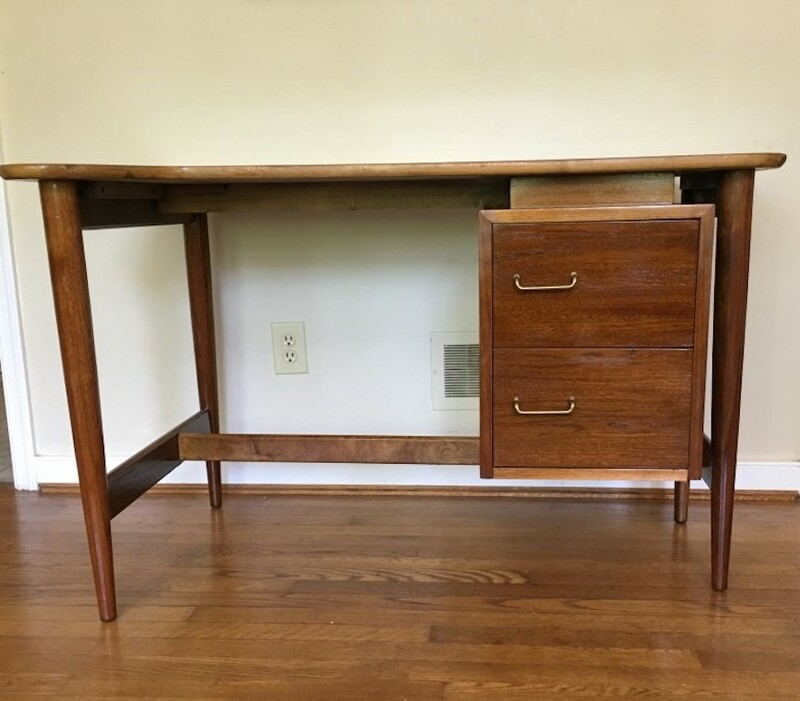 This impeccable Walnut Mid Century Modern Desk by American of Martinsville has been fully refinished using a beautiful, durable, water resistant tung oil varnish. This is a shining example of Mid Century Modern minimalist design. A floating cabinet housing two drawers are featured on the right side of the piece for storage. The desk top curves gently into an expanded work area, merging functionality and aesthetic appeal. Elongated brass pulls elegantly accentuate the warmth of the Walnut. All four legs taper brilliantly creating a clean appearance and making the curvature of the top the focal point. Meant to be viewed from all angles, all four sides are finished enabling versatility in the placement of the piece.